I recently came across a qaulitron led watch pen. Took a chance as the pen was untested (as-is). a) when unscrewing the pen it looks like I'm missing the battery cover over the "spring" that holds the two batteries in. This is making it very difficult to set the pen. Any ideas on what I could use as a makeshift cover? Maybe just shove alum. foil in there with a pin hole puched thru. b) any ideas on what ink refill to use? The refill is short (3mm x 34mm). Or has anyone had any luck with "refilling" the existing refill nib? c) For future reference - has anyone tried servicing this style pen? Any luck removing the module? It seems some else suggested the modules were glued in by factory :( Maybe heating the pen 175F for 15 minutes would soften the glue for module removal? Just thought I would ask. Interesting looks like your picture is just the battery with a spring on top? (that's how mine is, nothing holding the spring in place, however my spring is really bent out of shape and falls out easily). This is what I did; I peeled off two stalpes from a row of staples, bent them into a circle, then placed it on top of the spring. The threads seem to hold the staples in place which keeps the power applied. Then I can push the batteries with a thin tip and set the time ! Any it works, thanks for the help. I did try a few shops and they seemed "confused". The search continues - a cross matrix pen seems to have a similar looking refill, may try that. Will reply back if I find a workable refill. maybe just wrap a bit of tape around it? the saga continues... will try reseaching the web, or try purchasing a few old pens to see if something works. btw - the dimensions of the old refill appear to be 36-37mm long and 3.2-3.5mm OD. But I have a question, one of them (the gold one) says Qualitron (signed) the other just says "Sterling" and it is signed USA on the clip part (the silver one). Could anybody tell me the maker of this last one?! Have you tried maybe drilling the original refill and inserting a thinner one inside (kind of a sleeve/support)?! The impossible is only a point of view! The search still continues for the "perfect" refill replacement. If someone wants to try cleaning out the old ink and injecting new ink into the original refill let us know how that works. In my case I just had the one, and blew out the "ball" trying to clean it. However the "tactical" solution does work, for what it's worth. Credit to Kasper and other members for the idea. I found an old thread on the site that mentioned it before. Basically you take a new cross matrix refill, add a few turns of tape (I used blue masking tape), and insert the new refill into the END of the old refill (no drilling out the old refill). The insert the entire assy. into the pen ! The smaller point looks a little out of place, but hey "it does work"
See attached photos for more details. Now I can use my LED Pen to take notes in meetings and watch people stop and stare it. btw - the "sterling" IMHO is a re-branded qualitron. My Qualitron with russian documents and russian box with inscription Elektronika similar to Qualitron boxes, but for two pieces. Possibly 1977, according to docs. 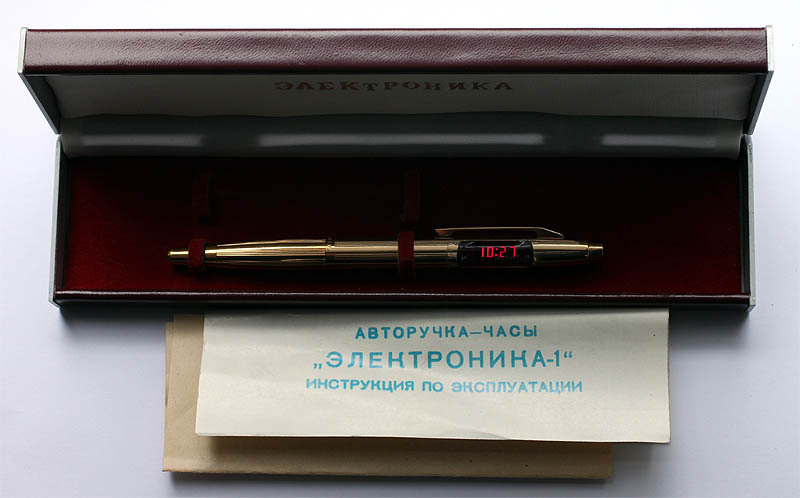 Seems to me USSR could buy pens for souvenirs. According to docs there could be russian variant of pen, but i didn't hear about it.